During my road trip though Ireland, I had planned to stop in Ballylongford because of a family connection there. Trying to find accommodations in the area, I booked a Bed and Breakfast a few miles away from Ballylongford and by chance right next to Carrigafoyle Castle. “Perfect, a double dose of history!” I thought. I had hoped to explore the castle the afternoon I arrived, but we were running late. As I was rushing my bags into the B&B, I mentioned to Garrett the owner, that I needed to hurry because the castle was closing in 30min. He laughed and explained that he was in charge of locking it up and would let us stay late. He jingled a huge ring of skeleton keys to prove it! 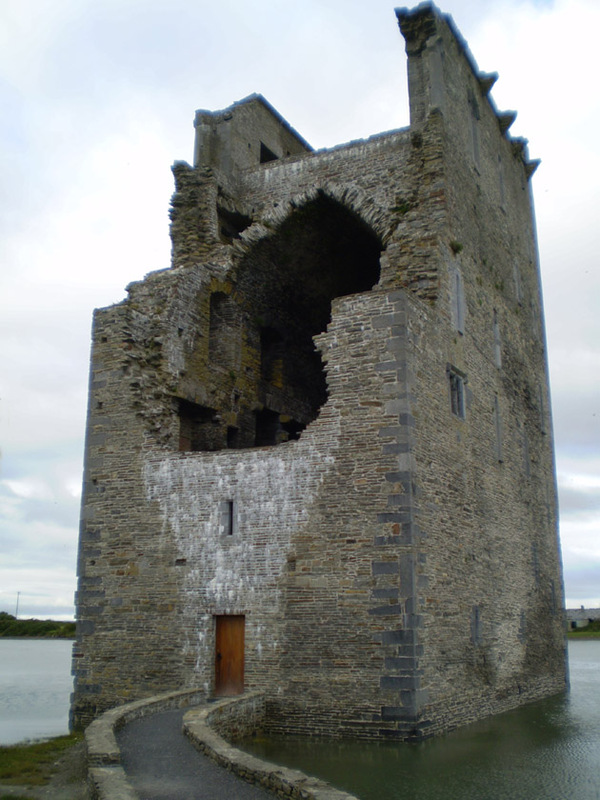 Carrigafoyle Castle was completed in 1480’s and served as the seat of the regional baron. Situated on a marshy portion of the coast accessible to ocean going vessels, it became a strategically important trading hub. In quelling part of the Second Desmond rebellion, Sir William Pelham of England bombarded the castle in March 1580, almost completely blowing off one side of the building. 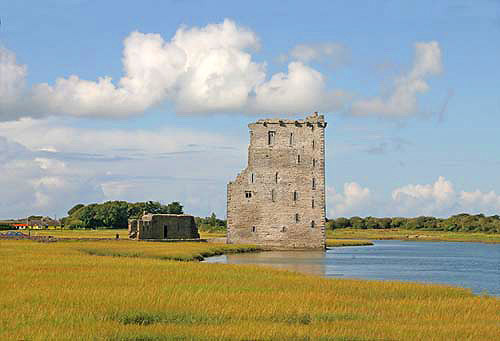 After this Irish defeat, Carrigafoyle Castle was left in ruin until money from the European Union was used to stabilize it in the early 2000’s. An impressive and heavy fortification, the square shaped castle is 86ft tall. The front entrance leads into a massive room with an arched ceiling. There are two large staircases which opened into the great room of each floor (now closed off with gates in the image above) and smaller working rooms where domestic and clerical activities occurred. The castle was constructed with small blocks of limestone and mortar. The broken walls therefore have a rough, wounded look. After some time walking through the castle, Garrett joined us. He opened some of the locked doors letting us into the periphery rooms with their blacken fireplaces and low ceilings. He explained what each room would have been for, how they would have been decorated and pointed out the wall holds that would have anchored the wooden flooring of each level’s great room. He unlocked the staircase to the roof and we were able to enjoy the view of the surrounding area. Using the 15th century iron lock works, he opened the original wooden “front door” on the ocean side, letting the water lap gently over the door step. 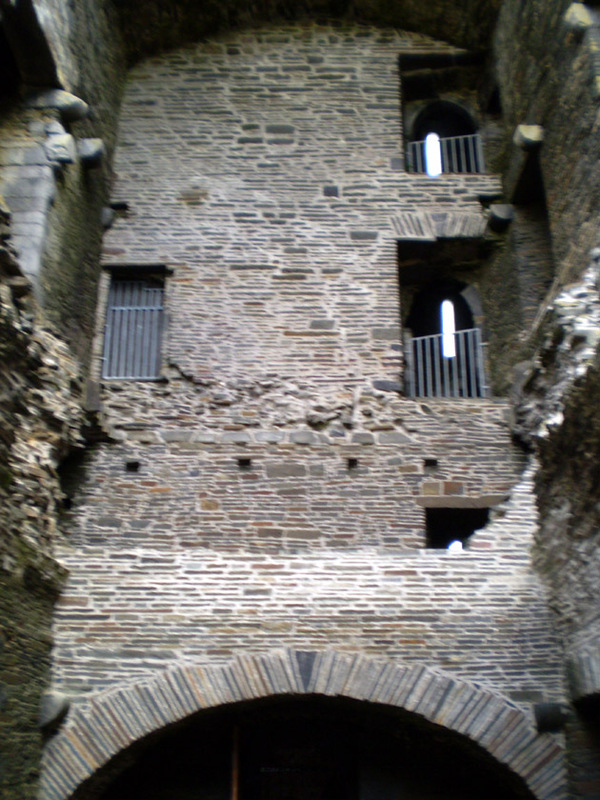 Garrett’s best stories were about playing in the ruined castle as a child. Imagine pretending you are a knight in your own ruined fort! Most of the recent restoration work had sought to make the castle safe, like filling in holes in the periphery rooms, fixing broken stairs and putting up gates over dangerous open drops. As a child, he had jumped and climbed through these hazards. I could tell Garrett missed the old ruined castle but was happy with the repairs. 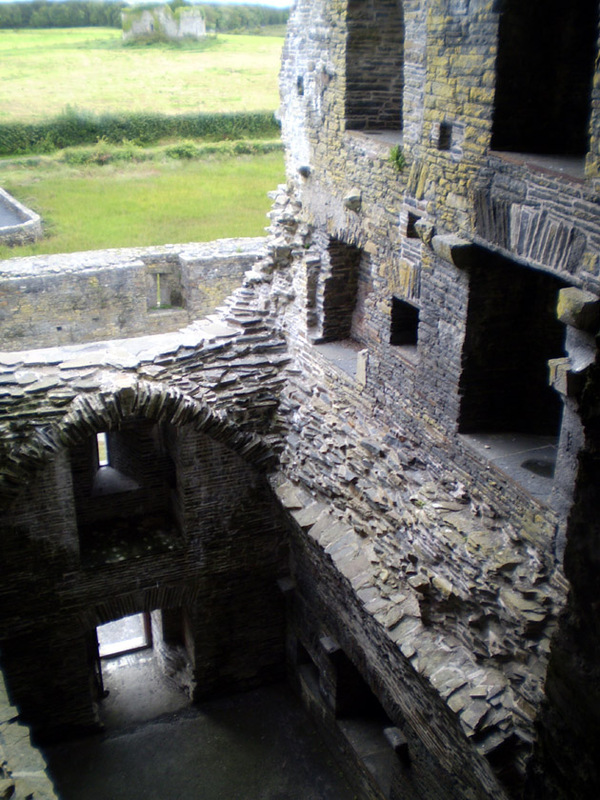 The castle still had its moss, bird’s nests and the raw, gaping damage of battle. 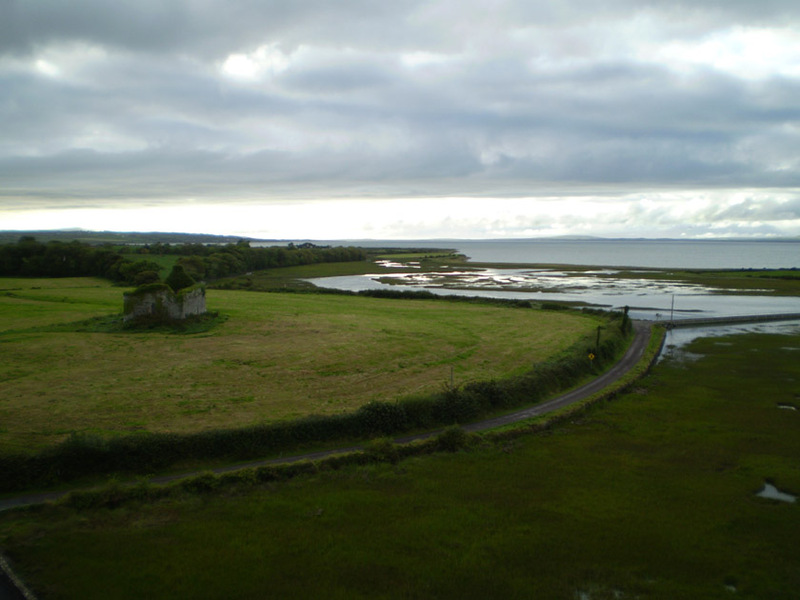 View from the top of Carrigafoyle Castle. It was from this small hill that the castle was bombarded and taken in 1580. Carrigafoyle Castle isn’t the most decorative building I’ve ever seen. Still, there was something incredible about the stone door framing and the little artistic patterns hammered into the original iron door hinges. I loved the feeling of impressive strength from the thick walls with their tiny, defensive slice-shaped windows. There was a sense of majesty from the grand, vaulted ceiling in the entry hall and the equally impressive vaulted upstairs hall. The cannon damage also gave me the opportunity to see the fort’s construction which is often hidden in complete castles. In the end, what made this such a memorable experience was being able to explore the castle with someone who knew so much about it – its history, design and little eccentricities – but who was also so connected to it personally. Remarkable photos, Christina. I love the interior shot with all of the castle’s intricate stonework evident as well as the glorious view from the top. Love it! Especially the stories told by the keeper. And the stonework is so pretty. There are so many ruins dotting the Irish countryside that have barely any information posted, so to have a private tour is just awesome. What a stroke of luck to have those the owner of the B & B also be the gate keeper of the castle! wow!!! The entire place to yourself…I would have loved every minute! !